Craft beer fans were quick to voice their displeasure on Twitter after the controversial spot. While you were cracking open a double IPA or sipping on a saison last night during the Super Bowl, you may have caught Budweiser’s “Brewed the Hard Way” commercial. It seems people are upset that Anheuser-Busch InBev (Budweiser’s parent company) decided to take shots at craft beer—especially since the company has purchased a number of high-profile craft breweries recently. Just a week ago, Anheuser-Busch announced it was buying Seattle’s Elysian Brewing Co.
Elysian was the fourth craft-brewery acquisition by AB InBev, the world’s largest beer company, in the last five years. AB InBev bought its first craft brewer in 2011, paying $38.8 million for Chicago-based Goose Island. It has also purchased 10 Barrel Brewing Co. and Blue Point Brewing Co.
Why the scramble to acquire craft breweries, and to catch up with American consumers? 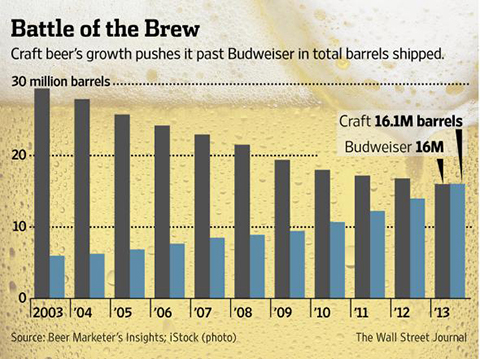 Budweiser has been losing market share to craft beer over the last four years. AB InBev’s beers still account for nearly half of the 200 million barrels of beer consumed annually in the U.S., according to the WSJ, but volumes have fallen nearly 9% over the past decade. At the same time, craft brewers’ market share has surged to more than 10%. A recent company study found that 44% of drinkers aged 21 to 27 have never tried Budweiser, reports Tripp Mickle at WSJ. Many are wondering why AB would choose to attack (and thus alienate) craft-beer drinkers, if those are the consumers Anheuser has been trying so hard to keep or win back. The Super Bowl commercial has spurred a hashtag, #BetterBeer. Here’s a look at what people have to say about the Budweiser spot. @JonnyBeers – I think it&apos;s a good time to parlay the truth. Bud is buying craft breweries because they know the truth about #BetterBeer. #CraftBeer is #BetterBeer Share the truth.